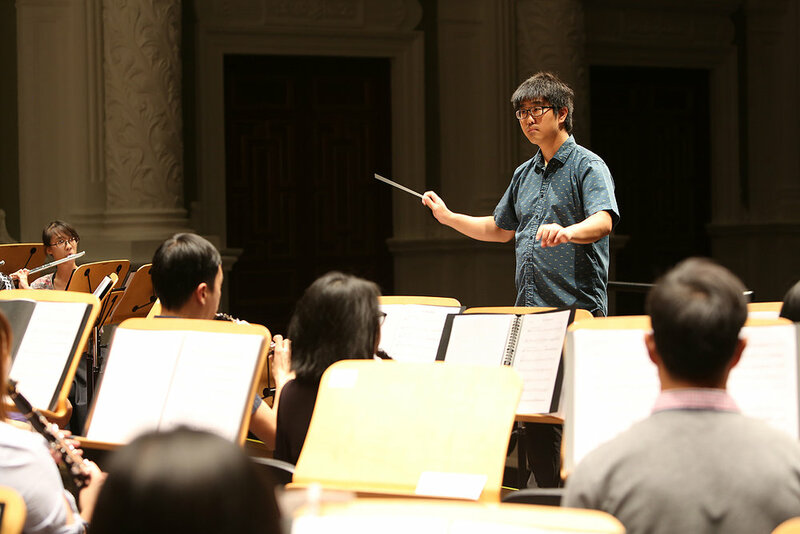 Quan Hui began conducting as a Student Conductor of Raffles Junior College Symphonic Band. He led the band to great heights, sweeping top prizes in all possible categories and even clinching for himself a specially created "Outstanding Student Conductor" award at the All-American Music Festival in Orlando, Florida in 1999. Subsequently, he organized and conducted the Raffles Institution Alumni Band in several performances, before leaving for his studies abroad. 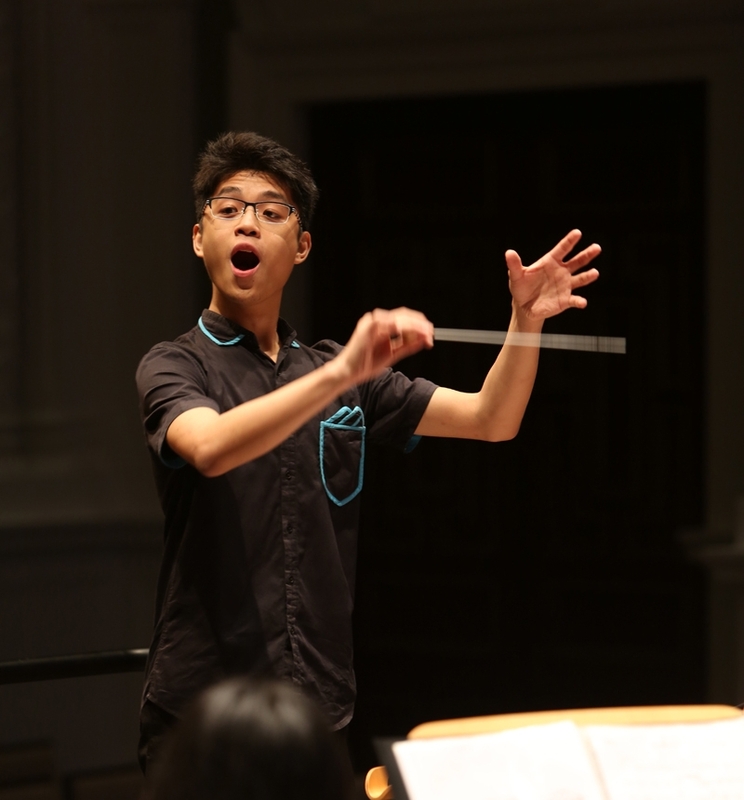 At Harvard, Quan Hui had the opportunity to study conducting with James Yannatos. Upon his return to Singapore, he was appointed Music Director of Raffles Winds in June 2007 and has led Raffles Winds in four successful performances. Adding a new dimension to Raffles Winds, he initiated, organized and performed in Raffles Winds’ inaugural chamber recital, Of Voices and Winds, to a full house. Besides conducting, Quan Hui sings operas and art songs. He has studied (and is still studying) classical singing with professors both locally and abroad. He has held four solo vocal recitals in Singapore and the United States, and has performed leading solo roles in chamber operas by Handel and Holst with local chamber opera group Operastudio. He has also been engaged by the International Festival Chorus and the Embassy of Germany as a soloist. Quan Hui also plays the trombone and piano. He graduated with a Bachelor’s degree in Economics from the University of Chicago and a Master’s degree in Regional Studies – East Asia from Harvard University. Award winning Singaporean composer Jinjun Lee has been actively involved in the music scene as both a composer, conductor and trumpeter for the past 10 years. 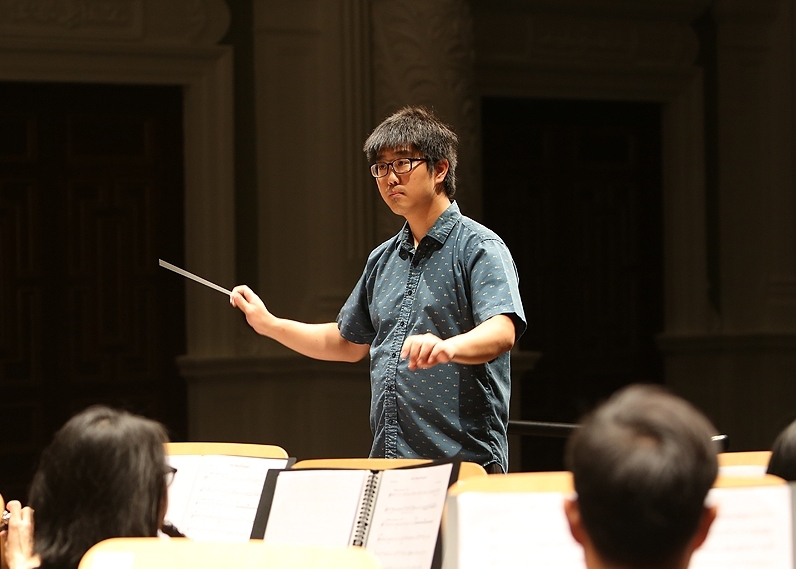 Previously a conducting student of Jason Lai, the principal conductor of the Yong Siew Toh Conservatory Orchestra and Associate Conductor for the Singapore Symphony Orchestra (SSO), Jinjun has conducted numerous performances at the Yong Siew Toh Conservatory of music. He has worked with various groups such as the Manchester Camerata, Royal Northern College of Music (RNCM) Brass Band, Eccles Borough Band, YST Conservatory Orchestra, the Conservatory Brass as well as the Boston Brass during their residency week at the conservatory. He has also attended the RNCM Conducting Weekend course, taught by RNCM conducting teachers Mark Heron and Clark Rundell. Jinjun also performs as a trumpeter for numerous groups, including the Orchestra of the Music Makers (OMM), Windstars Ensemble and Singapore National Youth Orchestra, and has taken part in the prestigious Cheltenham Festival of Music with OMM. Recently, he performed as a soloist with the National University of Singapore Wind Symphony. He studied trumpet under Singapore Symphony Orchestra Principal Trumpet Jon Dante at the Yong Siew Toh Conservatory of Music under a full scholarship. Darren Sng is a budding Singaporean composer with a fervent passion in music. He graduated from Raffles Institution in 2015 as a Music Elective Programme student and will begin his Bachelor of Music studies with a major in composition at the Royal College of Music in 2018. Darren studied composition under the tutelage of Mr. Derek Lim and Dr. Gooi Tah Choe, and has also been mentored by Mr. Tan Chan Boon, Dr. Ho Chee Kong, Dr. Peter Edwards, Mr. Eric Watson, and Mr. Terrence Wong. 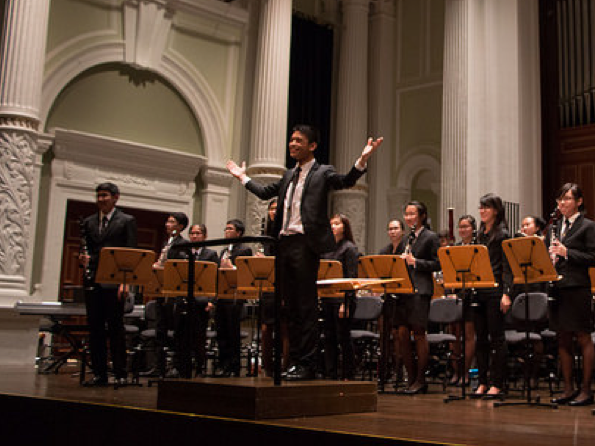 During his time in the Raffles Symphonic Band (RSB), Darren served as the student conductor and led the band in the concerts A Tempo XXIV and Bandemonium III. Subsequently, he went on to conduct the Raffles Winds and Catholic High School Alumni Band. Darren has also participated in wind band conducting masterclasses by Prof. Rodney Winther and Prof. Paula Crider. Darren was the winner of the inaugural Singapore Wind Symphony (SWS) Young Composers’ Challenge in 2015 for his march, Chronometer, for wind band. In 2016, his orchestration of Rachmaninoff’s Prelude op.23 no.1 for full orchestra was selected as the winning work of the Orchestra of the Music Makers Rachmaninoff Orchestrated! competition. He has also recently been selected to participate in the 2017 Young Composers’ Academy organised by the Yong Siew Toh Conservatory, which saw the development of his piece Suka.Suka for a trio of flute headjoint, cello body and piano strings. Darren’s passion for composition and conducting began when he was a student of Catholic High School in 2013, where he composed and musically directed the school’s first musical theatre production, Umbrellas in the Rain. Since then, he has written music for various performances and workshops, notably Khatib for ensemble, featured in the 2014 Singapore Composers Lab; Ripped Feathers for solo piano, played by pianist Moritz Ernst at the Composers Society of Singapore’s 10th Anniversary Concert; Look, an Edible House! for wind band, premiered by the Philharmonic Youth Winds in 2016; Baby Bird in the Forest, premiered by the Philharmonic Youth Winds in 2018; and An Oddball Fugue for percussion ensemble, commissioned by Wildfire Entertainment in 2018. He has also arranged music for local ensembles including the Singapore Wind Symphony (SWS), OBOG Wind Symphony, Singapore Sounds, and the Philharmonic Youth Winds.